Truffle butter is the simplest recipe with the most uses. Mash the butter (rather slightly salted butter, "demi-sel") with crumbled pieces of Périgord truffle. The more aroma the truffle has, the less is required. 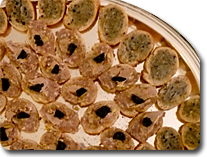 As a general rule, use a ratio of 20% Périgord truffle to 80% butter. This butter must be refrigerated in a hermetically sealed container for 24 hours before being used. Spread on small toasts or fresh bread. This butter can be kept in the freezer for 6 to 12 months. These dishes are usually accompanied by a white or rose champagne as an aperitif or by, for example, a Moelleux de Saussignac.